When performing epidural steroid injections for the management of chronic back pain, imaging guidance and a limited epidurogram improve accuracy of needle placement and ensure appropriate delivery of the injectate into the epidural space. We describe our experience using a gadolinium chelate as an alternative contrast agent for limited epidurography in patients with a history of an iodinated contrast reaction. Thirty-eight of 2,067 (1.8%) epidural steroid injections performed in our department over a 25-month period (December 2003–January 2006) employed gadolinium. All injections were performed in the lumbar spine employing a paramedian interlaminar approach. Procedural notes and patient charts were reviewed to evaluate for immediate or delayed complications related to incorrect intrathecal or intravascular needle placement. 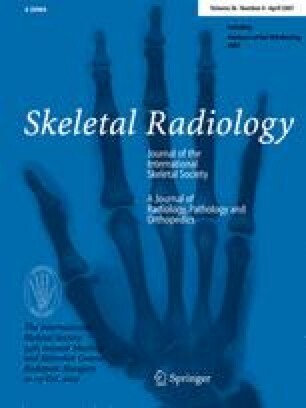 A retrospective analysis of selected fluoroscopic spot images was performed to evaluate confidence of epidural needle placement; this analysis compared these spot images against those obtained from age- and gender-matched control patients in whom iodinated contrast was used to confirm needle placement. Real-time fluoroscopic guidance permitted confident visualization of an epidurogram at the time of procedure in all 38 cases as documented in the procedural report, and no procedure resulted in a complication due to incorrect needle placement. Retrospective review of fluoroscopic spot images revealed at least moderate confidence of epidural needle placement by both readers in 29/38 cases (76.3%). Fluoroscopic spot images obtained using gadolinium yielded significantly less confidence than images obtained in control patients whose procedures were performed using iodinated contrast (P < 0.01). However, operators were sufficiently confident in needle placement based on real-time fluoroscopic images (not available in our subsequent review) to inject anesthestic in all 38 cases, despite the immediate consequences that could result from intrathecal administration. During the same time period, there were 11/2,067 (0.5%) instances of intrathecal needle placement discovered during attempted epidurography despite the use of fluoroscopy for needle guidance and reliance on loss-of-resistance technique. Gadolinium chelate represents a safe and useful alternative contrast agent for confirmation of epidural needle placement in patients with an iodinated contrast allergy.